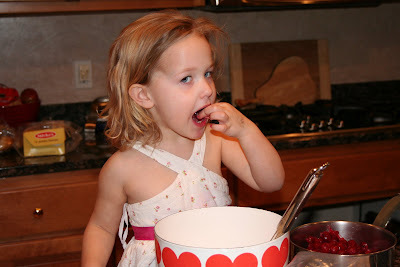 What Lily is putting in her mouth is not a plum but a cherry, and it was supposed to be part of our Valentine Cherry Pie...it and about 30 other cherries which she scarfed down while I ran upstairs for the camera. These are the SOUREST cherries on the face of the earth, let me tell you! (And they make the best pies.) 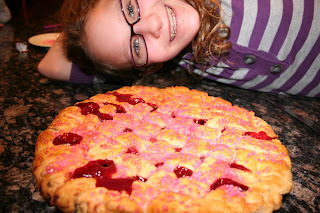 My parents grow them in southern IL, and I am blessed that Mom loves to share, so it was with great fanfare that we pulled our LAST package of said cherries out of the freezer on Feb. 14th to make the pie. Lily went crazy for the raw, unsweetened cherries. Seeing how enthusiastically (and quickly) whe was throwing them down, I wisely deduced that this particular batch must not be as sour as usual...WRONG!...although I put the normal amount of sugar in, the pie was still unbelievably, and wonderfully, tart. But, we like tart around here! Obviously! 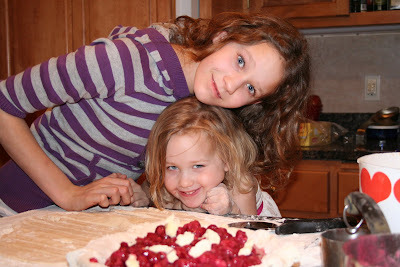 So here we are, my two bakers in training, with the latticework ready to go on. 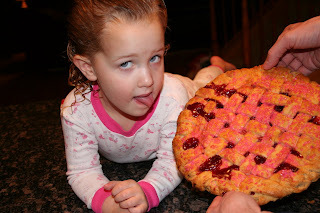 In my opinion, cherry pie must have latticework. 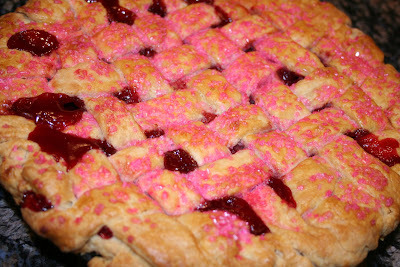 Crumb topping is quicker, I know...but cherry deserves the best...something about the red peeking through the woven pastry.... Now I had talked to my mother earlier in the evening, and she had told me to add extra sugar, and to cook the pie filling on the stove and then put it into the shell so it wouldn't run over and drip all over my oven. You guessed it; I did neither! This has been a problem my whole life. ("I Did It My Way" was my favorite song for awhile in jr. high.) That's the thing about my mom; she is not pushy, she is not opinionated, but somehow (stink) she is right. I'll blog about that more later. Anyway, I forget WHY I wanted to do it "my way", but let me just say that I didn't take a picture of my oven after this whole thing practically dripped a lake while it baked and filled the house with smoke, because I was too busy fanning the fire alarm with the broom...you'll probably notice the haze in the finished product picture. We topped it off with pink sugar crystals...which look a tad unappetizing in the picture, but in real life were a great Valentiney touch! Don't you love Katie's glasses? They are purple and look great on her. And as for this picture of Lily...well...you see what I'm working with here???? The pie was delicious...although very sour...should of put that extra sugar in! Keep trying Mom! 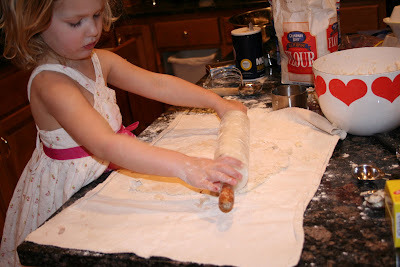 This last picture is of Lily...after she grabbed the hot pie plate and burned (barely) all her little fingers. 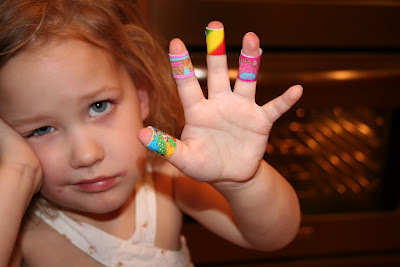 But as you can see, we have no dirth of bandaid variety here; in fact, my stock of bandaids is museum quality. You could even say I collect them. What a lame thing to collect!